Sure, you know not to leave your pets or your kids in your car in the summer, but what about valuables and other objects? If you leave one of these items in your car, you could end up with a mess, be an easy target for thieves, or risk serious injury. In the summer, the greenhouse effect can cause interior temperatures to rise well above ambient temperatures. As heat enters your vehicle, some of it is absorbed by the interior, then released. However, not all this heat can pass back through the windows. Over time, this trapped heat builds up, turning your car into an oven. While we don’t live in the hottest part of the U.S, your car can still become dangerously hot. On average, the interior of a car can reach 125°F after an hour parked outside when it’s 80°F out. Going south for vacation? At 95°F, it takes just 20 minutes for the interior to reach 124°F, and after an hour temperatures can top 140°F. In the winter, your car won’t get colder than the outside temperature, but there are still plenty of items that can be damaged when stored in freezing temperatures. The following items are highly susceptible to heat or cold damage. As the wood shrinks from cold temperatures, it can stress the strings on your guitar or violin. Extreme temperatures can weaken or destroy the active ingredients in medicines. Most medicines are designed for storage at “room temperature,” defined as 68-77°F and periods of temperatures up to 86°F. When in doubt, ask your pharmacist about safe storage. Like medications, the active ingredients in sunscreen break down in high heat, while the ingredients can separate in extreme cold. In the winter, water bottles will leave behind slush that’s easy to clean, but an exploding soda will coat your car’s interior with a sticky mess. In the summer, BPA in bottles and coated cans will leach into drinks, while open containers can become a breeding ground for bacteria. At temperatures above 120°F, the pressure inside a spray paint can reach a point that the metal will split. It won’t just coat everything in paint: the force is high enough to turn the can into a projectile that can break windows and cause serious injury. Extreme heat can warp both metal and plastic frames, while the lens shape can concentrate sunlight, burning holes in your interior. Heat won’t just change the taste of wine, it can “cork” it by forcing the wine into the cork as it expands. Obviously, you don’t want to drive around with ice cream and frozen foods in your car, but refrigerated foods are also at risk. The USDA recommends limiting perishable foods to one hour of exposure at temperatures over 90°F. Likewise, freezing can break open eggs and canned goods, making them unsafe for consumption. You might start planning gardens and indoor planting early in the spring, but picking them up at the wrong time could harm or kill them. Even at temperatures in the 40s, plants can die in less than an hour, while contact with cold windows can sap heat, shriveling leaves. All makeup can be damaged by temperature, but none more than lipstick. Its high oil content makes it easy to melt, pouring out of the container where it can ruin upholstery. Smartphones and laptops don’t just tempt thieves, they also aren’t designed for extreme temperatures. For most devices not designed for in-car use, manufacturers recommend keeping them between 32-100°F while on and 0-113°F when turned off. Purses, electronics, and luggage are obvious targets for theft, but there are a couple more unusual items that are common targets for thieves. Registrations are used to forge legal documents. 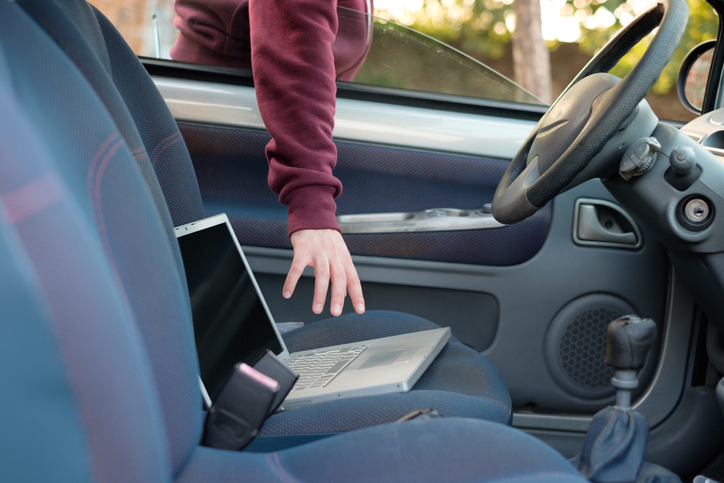 If your car was broken into and nothing obvious seems to be missing, check the glovebox for missing documents and report them to the police immediately. You can’t legally drive without the registration, but you can keep it safe by locking it in the glove box. If a thief gets hold of either item, they can easily enter your house. When you’re looking for collision repair in the Lake Country area, turn to Merton Auto Body. We’ve been in business since the 40s, and we continue to evolve with the times. Our technicians receive the latest training from I-CAR, and we have an on-site appraisal center that can work with your insurance company to get work approved. Our shop is between highways 164 and 83, just off Silver Spring Dr. That means we’re a short drive or tow away from Pewaukee, Hartland and Oconomowoc.